As a travel agent, I often look for tips to help my clients have a better experience wherever they are going. Even on road trips. Especially on road trips. Especially on road trips… with kids. Our own children are far from easy to deal with on the road. Grayson is NOT fond of his car seat. On many levels… but especially if the car isn’t moving. Sadly, there’s not a whole lot I can do for him. BUT – the other thing he’s not fond of, I do have more control over – that being Becca’s volume. When she gets tired and frustrated, she gets LOUD. Really, really LOUD. And then Brother starts crying even harder and louder. And then Mommy and Daddy really just need ear plugs because there’s nothing we can do. We have been known to pull into a Burger King parking lot way after dark and attempt to tame the savage beasts a little by reading books and feeding a bottle. But honestly, we are still on the search for what works for us in the car. (And yes, I’ve tried a million cute games and magazines and magna doodle things. But, when it’s bed time, it’s just bed time, and nothing can change that.) So, my “Traveling Tuesday” posts the next few weeks leading up to your holiday travels for Thanksgiving will have tips and tricks for traveling with your kids, but it may be a while before they include anything for on the road… B/c we are still searching for that secret. So today’s tip is about once you get to your destination – our trip was to the Grandparent’s house. The grandparents have great toys that are different from what we have, but I also know that it’s good to bring something familiar just in case little Miss Picky decides she doesn’t like any of the toys and the “I’m BORED!” statement comes out. Thankfully, we did really well on this trip – I think because Mommy packed lots of stuff to do in addition to all the fun stuff already there. Becca loves sensory bins. And she loves sorting. She played with this bin a little bit there, and then has played with it a lot at home. So… how do you travel with a sensory bin? Because you’re probably thinking of a large tub with a lot of messy junk in it, right? WRONG. A traveling sensory bin should be something basic and simple, and not very messy. And most importantly, it needs to go in a traveling container that has a lid. You need something like this. 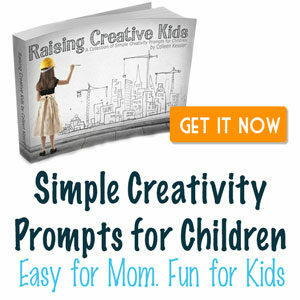 (aff link – thank you!) I found some that were different colors, so mine is purple, not white like this one. But the important features are the lid, the clips to hold it closed, and the handle. So what did I put inside mine? I got paper flower petals from www.consumercrafts.com (not an affiliate link, but it seriously should be as much as I love their stuff and tell everyone in the world about their website…), threw in some little white shiny poms for a different texture, and then did what I’m starting to become famous for – took foam butterfly stickers and stuck them together to create some nice thick, cushy foam butterflies. 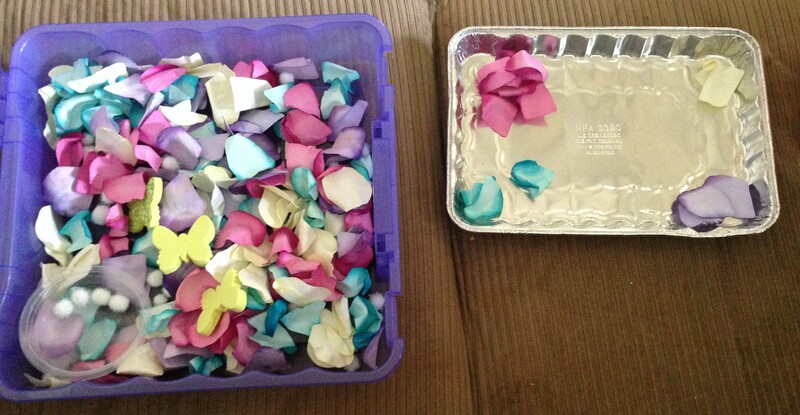 Here’s one way she can interact with the bin – by sorting the flower petals by color, and putting the poms in a bowl. She seems to enjoy pulling out the butterflies and flying them around the room more, though. I’m good with that. In a couple days, I plan to throw all this stuff in a big ziploc bag, and hide it in the cabinet til Spring comes around. 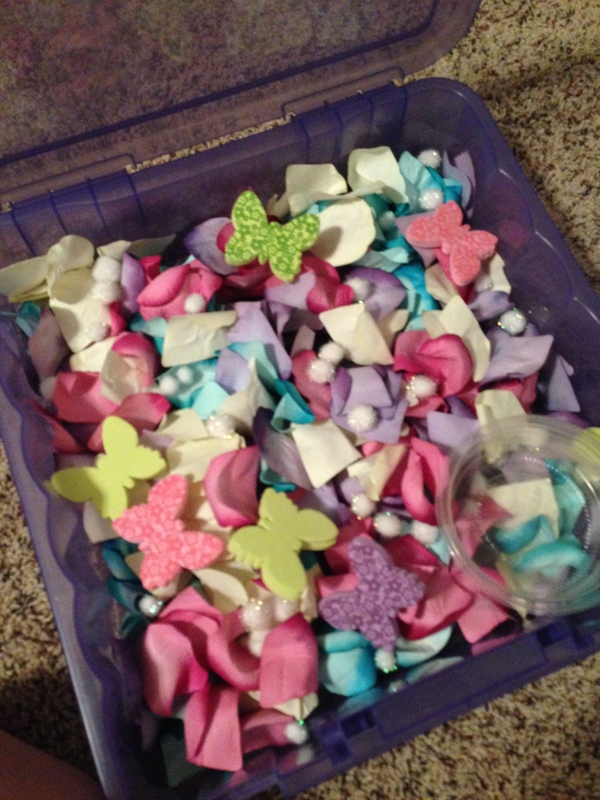 But with a little girl who loves flowers and butterflies, it’s NEVER off-season to make a butterfly/flower petal sensory bin! 🙂 I’m already starting to contemplate what sort of non-horribly-messy fall stuff I can throw in a bin… pictures will no doubt come later. Total Prep Time for Mommy: This one took a tad longer than it should have b/c I had the darndest time peeling the back off of some of the butterflies to stick them together! I had estimated it’d take me about three minutes to dump it all together into the box, but with my sticker issues, it took more like 10 minutes. Total Play Time for Becca: The first time, she was highly distracted (at grandparent’s house, remember), so she played with it off and on over the course of 30-45 minutes. At home, she has played with it exclusively for up to 15 minutes.